Everyone in Hollywood wants to be in a new Star Wars movie, even those who have been in one before, and even those whose character may be a wee bit dead. Despite the fact that the majority of fans pan the Episode I—The Phantom Menace (but not all, don’t worry, we’re well aware that there are supporters out there), there are some bright spots. One of these is Liam Neeson, who recently indicated that he’s not opposed to coming back for another go round in that far, far away galaxy. Pumping his latest action sequel, Taken 3, which opens in theaters today, Yahoo UK sat down with the 62-year-old actor, who plays Qui-Gon Jinn, mentor to Ewan Macgregor’s Obi-Wan Kenobi. No matter what the topic, these days it’s damn near impossible to talk to anyone even tangentially involved with Star Wars and not ask them about it, and this interview is no exception. One potential way the character could return is in one of the much talked about spinoffs that are in the works. Perhaps one could follow the adventures of a young Qui-Gon Jinn, though that would probably mean that there wouldn’t be a part for Neeson. Many of you probably remember that getting lightsabered by Darth Maul isn’t actually the last we see of Qui-Gon. He shows up in The Clone Wars as a Force Ghost, giving sage advice to Obi-Wan. The dead are so wise. It’s also possible his Force Ghost could turn up again in one of the Episode movies, perhaps talking to Luke Skywalker. We’ve seen Luke chat with Yoda, Anakin, and Obi-Wan, all Jedi who have had a big influence on his life, and Qui-Gon is kind of the one who got that ball rolling, finding young Anakin in The Phantom Menace, so it wouldn’t be too far out to see him show up in this capacity. This is really nothing more than an offhand comment, and in no way should be taken by anyone as “OMG, Liam Neeson is returning to Star Wars!! !” But it is a fun topic to speculate about, and with the way Disney and Lucasfilm are going about expanding the universe, it’s not entirely outside the realm of possibility. 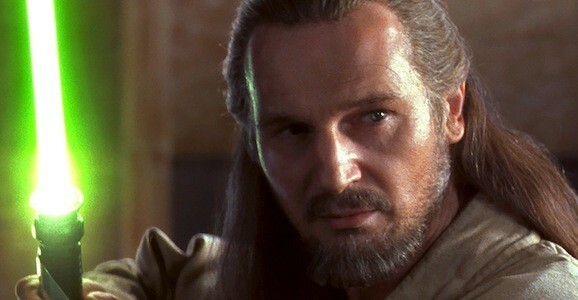 Would you like to see more Qui-Gon Jinn in Star Wars? We were all excited to see him and then he kicks the bucket before the end of the first movie, so there’s definitely space to work with the character if they want. He is the one after dead is still a separate in the force and instructs yoda in that ability ( see revenge of the sith book ). He also teaches Obi Wan between star wars 3 and 4. He was the big believer in Anakin not obi wan. That’s rad, they could totally find a way to bring him back. He was the best part of the Phantom Menace. As much as I like Ewan McGregor there’s a part of me that always thought the PT might have worked out better if the Qui Gon character was cut and Neeson had played Obi Wan. Also cast Anakin in Episode I as a teenager (heck, Ewan could probably even play him). We can then get immature whiney Anakin out of the way in Episode I and have a more badass and good guy Anakin (a la clone wars and the beginning of rots) in episodes II and III. Too late now I guess. hope McGregor can be in other star war movies, he is a great actor. Too easy. There’s a whole series of Star Wars YA books called Jedi Apprentice. Liam and a young Obi-Wan actor could reprise their roles in a prequel spinoff showing the rise of Kenobi.